River trails. Rail trails. Bush trails. Urban trails. New Zealand offers the lot in spectacular fashion. The three islands that make up New Zealand offer some of the most spectacular scenery on earth. In the past it was necessary to use motorized transport to get around. Not anymore! Currently, there are 50 cycle trails covering 2,500kms that allow cyclists to take their time to smell the sweet air and savour the spectacular landscapes around them. Like many other large cities, Auckland has major traffic problems with commuter times taking longer as more cars join the city’s roads. The Heartland Ride allows cyclists to travel 118km from the small northern town of Dargaville to the heart of Auckland city. This ride has an interesting component – it involves a ferry to cross New Zealand’s largest inland harbour. 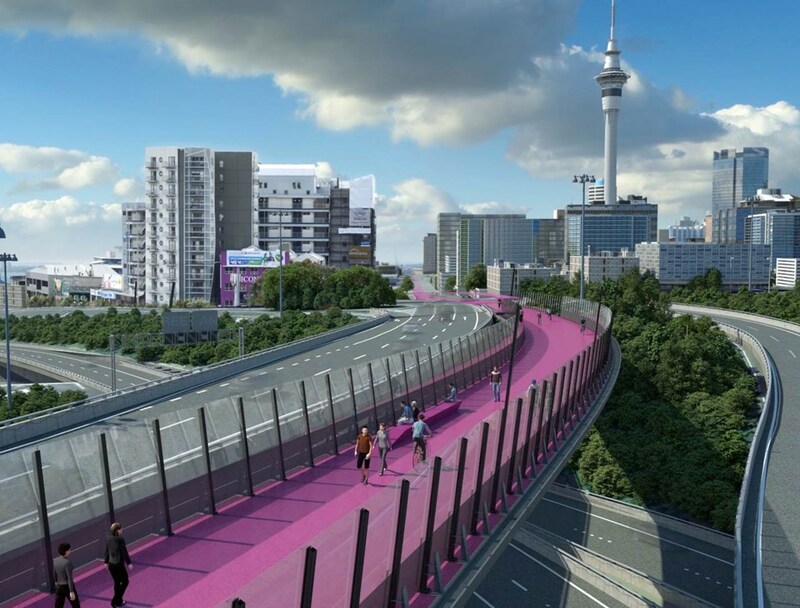 On the Auckland side of the harbour, a specially constructed cycleway follows the North Western Motorway right into the heart of the CBD. It may not be one of the more scenic bike trails in the country, but it is certainly different. The Heartland Ride gives cyclists an opportunity to admire the collection of high rise apartment buildings and hotels clustered within the central city, something it’s not so easy to do when driving a car and needing to keep your concentration on other traffic. This ride is also an opportunity to experience urban New Zealand as you cycle past the western suburbs in the city’s vast urban sprawl. Other parts of Auckland can also be explored on bike as the city has more cycle lanes than anywhere else in the country. A new cycle bridge over the South Western Motorway allows you to ride your bike from the CBD to the airport. The 30km trip takes 2 hours so you wouldn’t need to be in a hurry, but it is an interesting way to see more of the city in a leisurely manner. A 74km trail around Rotorua winds through the Waimangu Volcanic Valley with its hot pools and steaming fissures. Active geysers in the area remind you this is a living geothermal area where the earth’s crust is the thinnest on the planet. It can be dangerous to wander off established paths but this danger is part of the appeal. The fern shrouded part of the trail is particularly memorable and is perhaps the main attraction for cyclists from other countries. This rather remote central North Island trail takes you through a beautiful New Zealand native forest. These forests always have a distinctive sweet aroma caused by rotting pungas and leaves from a selection of native trees that decompose on the forest floor. I have been in forests in a number of countries but none have the distinctive, and very pleasant, aromas found in a New Zealand native forest. Following an old spiral bush tramway originally constructed in 1910 to transport timber from the forest to a sawmill, this 85km bike trail through the 78,000 hectare Pureora Forest, also crosses a couple of suspension bridges. One of them is 141 metres long and 60m high, making it one of the country’s highest and longest suspension bridges. To add to the interest, a couple of dank, dark tunnels are also there to add to the excitement of this trail. Here’s a great video taken with a Go Cam to give you an idea what a New Zealand native forest looks like to cycle through. We’re in the South Island now where New Zealand’s most spectacular scenery is found. This is the island most overseas visitors want to see. The mountains, lakes, fiords, glaciers, alpine resorts, wineries and coastal splendour are what currently make New Zealand one of the world’s most popular destinations. The Heaphy Mountain Bike Track follows the route of a narrow pass originally developed in 1888 for gold prospectors to search for gold along this rugged shoreline and little has changed with it since. This popular biking track crosses the Kahurangi National Park and is regarded as one of the world’s top mountain bike tracks. Apart from the stunning scenery, especially along the elemental west coast, kiwi birds can be seen as well as giant carnivorous snails! 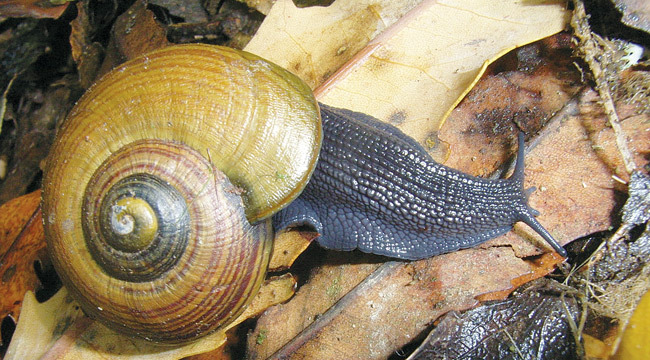 These creatures with their colourful shells, ranging in colour from red to yellow and black, are the largest snails in the world and can grow to the size of a man’s fist. They are now endangered but don’t worry, they won’t bite humans. They live in South Island native forests, some of which border the track. Have a look as this giant snail attacks a poor worm. 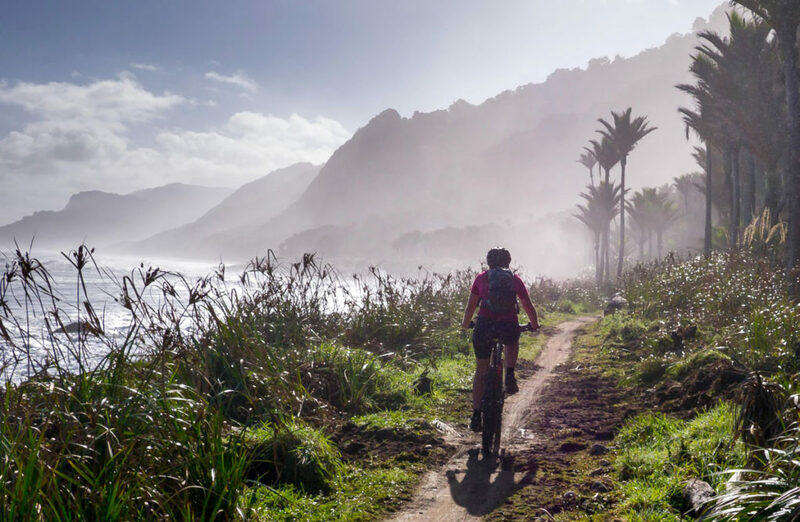 The Heaphy Track is recognized as one of the world’s top wilderness walks attracting thousands of trampers but it becomes the mountain bike track over the winter months when hiker numbers are at their lowest. To protect the track no more than 6 mountain bikers are allowed on the track at the same time. These small groups only add to the adventure of cycling along this amazing track. Check out this short video taken on the Heaphy Track. This cycle trail is by far the most popular ride in New Zealand. It also attracts overseas riders who undertake the 150km trail from either Clyde or Middlemarch. Riders can also start their adventure in Dunedin City by catching the Taieri Gorge train on the 64km trip through a rugged gorge to Middlemarch. I will talk more about this train trip in an upcoming blog. 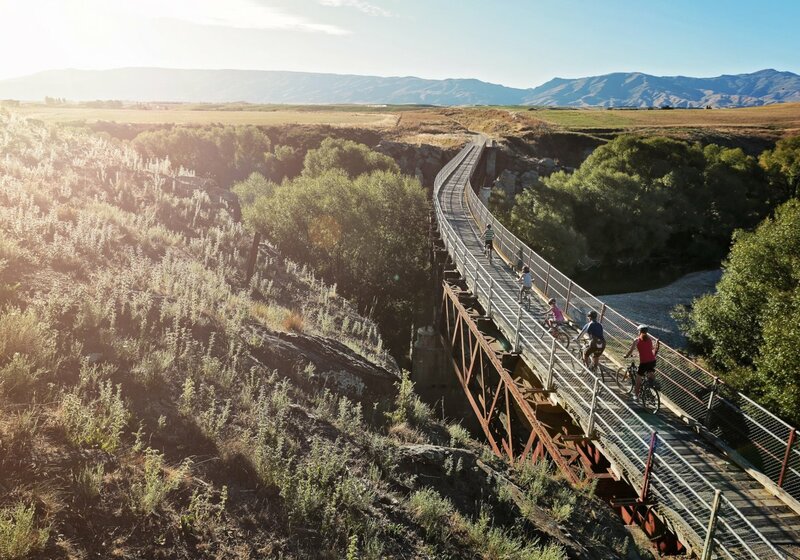 Although there are a number of other rail trails set up for cyclists, the Otago Central Rail Trail was the first and is considered by far the best of them all. Last year, 24,000 cyclists explored this extremely popular attraction including groups of nudists on their bikes, along with riders dressed as fantasy heroes. It is popular with groups of office workers from around New Zealand who get together to ride the trail. As well as these people, horse riders are allowed to use parts of the trail but they must respect cyclists who have priority along the full length of the trail. This Central Otago trail has brought new life to the towns of Ranfurly, Hyde, Clyde and Middlemarch. New and refurbished hotels, bed and breakfast homes, pubs and cafes, as well as tours to numerous attractions off the trail, have all boomed since the trail was established in 2000. It follows the route of a railway that was started in 1879 and closed in 1990. The trail traverses massive viaducts and enters spooky tunnels as it carries riders across the sweeping landscapes found in this part of New Zealand. Peter Jackson used the unusual landscape around Middlemarch for his Lord of the Ring films, including Sutton Salt Water Lake with its strange schist tors that give it a real “Middle Earth” look. The National Cycleway Project was formed by the government three years ago and as of this year, 50 million dollars have been spent to create 2,500kms of cycle ways. When completed, this project will allow a cyclist to pedal the full length of the country on dedicated cycle tracks. What a great way to appreciate the spectacular and ever changing scenery this country is famous for. Here is a short promo video on the Otago Central Rail Trail. Please check the archive page for previous blogs to read. Very well written indeed. Keep up the good work.